Here's something you don't see often: a tuner car more faithful to a brand image than the product it's based on. 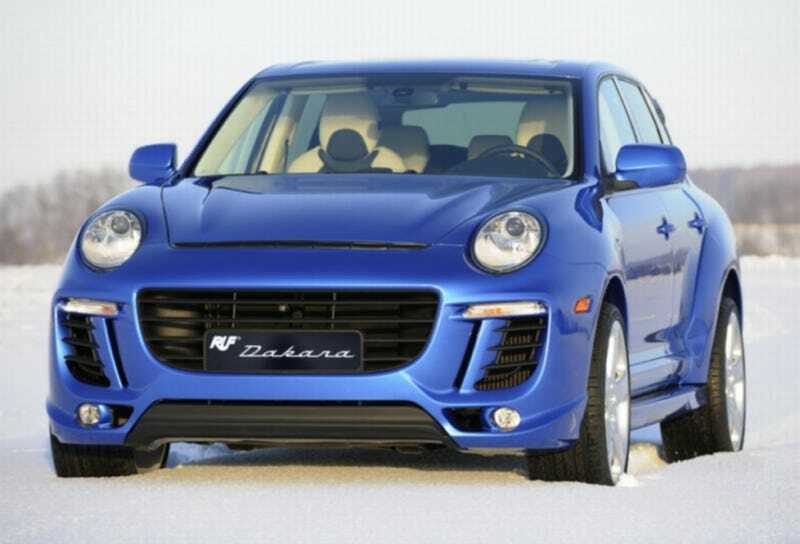 Somehow the Porsche Cayenne-based RUF Dakara manages attractive, round 911-style headlights. We're still not too enthusiastic about the idea of a Porsche SUV to begin with, but we recognize they've sold enough Cayennes to make Budweiser sales at NASCAR events look slow. The market has spoken. The RUF boys have taken the Cayenne and restyled the offending elements and delivered a Cayenne which might have transcended the shortcomings of the segment and actually looks... dare we say it? Good. Between the installation of 911 headlights, a front fascia which borrows from historical Ferrari's as much as it does Porsche, widened fenders and an inoffensive set of wheels, the Dakara is looking mighty dapper in it's deep blue hue. Ceramic brakes and a turbocharged V8 pushing out 600 HP and 659 lb-ft of twist don't hurt either. The RUF Dakara is set to be unveiled later today at the Geneva Motor Show. GENEVA, Switzerland, 5 March, 2009 - The High Luxury SUV built by RUF is named Dakara and is based on the Porsche Cayenne. The exterior and interior is able to embrace the most ambitious wishes. Because of the 911-headlights, the Dakara affects like a sports car. Four 22 inch- five spoke wheels and the broadened fenders demonstrate pure power. The bodykit fits to every Cayenne. Cameras in the front and in the back of the Dakara cater for the panorama view. The interior room is affected by complex processed leather trim which does not only fascinate with the precious materials but also with the new designed seats. A High-End Multimedia system with TV-reception, access to the internet and a CD-/DVD-Changer will gratify even the highest requirements. The V8-Turbomotor offers an engine output of 600 horsepower (600 Ps) at 6000 rpm. The maximum torque of 659 lb-ft/lbs (890 Nm) is delivered at 3000 rpm. So the Dakara is able to reach the speed of 62 mph (100 Km/h) in 4,8 sec. The chassis as well as the brake system are adjusted to the high requirements. Even ceramic-composite brakes are available.The Dakara perfectly ties in with the RUF model-range.